Two months ago (April 2018) we met Codex Sangallensis (a.k.a. Codex Δ (Delta), or 037), an important manuscript of the Gospels, in which the Greek text is accompanied by an interlinear Latin translation. (This Latin text is known as VL (Vetus Latina) 77.) 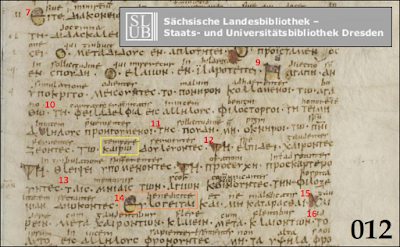 Today, let’s get to know Codex Δ’s sibling: Codex Boernerianus (a.k.a. Codex Gp or 012), made in the 800s. It is a copy of the Epistles of Paul (not including Hebrews), and is named after the German scholar Christian Frederick Boerner (1685-1753), who loaned it to his contemporary Richard Bentley. It has been cited in compilations of the Greek New Testament ever since the 1752 edition by Johann Jakob Wettstein. Codex 012 was probably a companion-volume of Codex 037; they are very similar in size and format. The text of 012 is not quite complete. It is missing some portions – Romans 1:1-4, Romans 2:17-24, Romans 14:24-36 (as presented in the usual Byzantine Text), First Corinthians 3:8-16, First Corinthians 6:7-14, Colossians 2:1-8, and the last five verses of Philemon. In each case, the copyist perceived that his exemplar was defective, and left memorial-space to convey that there should be additional text where the page on which he wrote was blank. Photographs of 012 were made in 1909, and that was a fortunate event, because a few decades later in 1945, during World War II, the manuscript was severely damaged when the city of Dresden (where it was kept) was bombed. The photographs of the pages from 1909 can be viewed online at the website of the Saxon State and University Library at Dresden. (The book-by-book index, though all in German, is easy to understand.) All of the 1909 photos of the entire manuscript can be downloaded as a PDF, too. 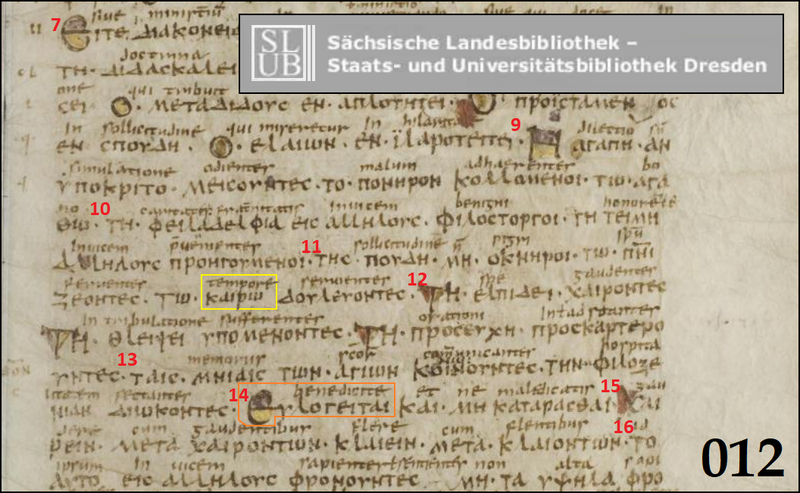 Gary S. Dykes has provided an introduction to the 1909 facsimile of 012 (with an informative section about the relationship between Codex Boernerianus and Codex Augiensis), and at CSNTM, facsimile-pages have been indexed page by page. 3 – 012 repeats τὸ ἀγαθὸν, a case of dittography. 3 – 012 skips παρ’ ὃ δεῖ φρονεῖν, a case of parablepsis (the copyist’s line of sight drifted from the final letters of the preceding word ὑπερφρονεῖν to the same letters that occur a little later in the text). 4 – 012 begins the verse with ωσπερ instead of καθάπερ. 5 – 012 does not have the word ἐσμεν. 8 – 012 does not have ειτε at the beginning of the verse. 8 – 012 repeats εν τη after παρακαλων (another case of dittography). 9 – 012 reads μεισουντες instead of αποστυγουντες. 11 – 012 reads καιρω (“time”) instead of Κυρίω (“Lord”). This variant is old; Jerome alluded to it in his Epistle 27, To Marcella), and, if Rufinus did not expand on the comments of Origen when he (Rufinus) translated his (Origen’s) commentary on Romans, then Origen, in the first half of the 200s, was also aware of this variant. Ambrosiaster, too, shows an awareness of this reading; he even prefers it, proposing that it was meant to convey the same idea as Ephesians 5:16. It was later adopted by the scholar Stephanus in his 1550 edition of the Greek New Testament – a clear example of the variations among different compilations that circulated in the 1500s, showing that Stephanus and Beza did not unthinkingly reproduce the work of Erasmus. 13 – 012 reads μνίαις instead of χρείαις. 14 – 012 skips the words τους διώκοντας ὑμᾶς εὐλογειτε, a case of parablepsis in which the copyist’s line of sight drifted from the εὐλογειτε at the beginning of the verse to the same word a little later in the text. 17 – 012 has an extra phrase, ου μονον ενώπειον του Θυ αλλα κει, so as to make the sentence read, “Give careful thought to do what is right not only in the sight of God but also in the sight of all men.” The Greek text has been conformed to the Vulgate, in which this part of the verse is made to resemble Second Corinthians 8:21. 21 – 012 reads απο instead of υπο. 1 – 012 reads Αιώκεται instead of Διώκετε. Apparently somewhere along the line, a copyist misread his exemplar, confusing the similar letters Α (alpha) and Δ (delta). 2 – 012 reads γλώσσαις instead of γλώσσῃ. 5 – 012 reads αλλειν instead of λαλειν, a case of letter-transposition. 7-9 – 012 does not have the word τοις, and reads γνώσθη instead of γνώσθησεται. It also reads γλώσσ instead of γλώσσης in v. 9, as if copied verbatim from a damaged exemplar. 10 – 012 does not have τοσαυτα at the beginning of the verse. 10 – 012 adds εστιν after αφωνον. 10 – 012 reads γινώσκω instead of ειδω. 21 – 012 reads ετεραις γλώσσαις instead of ετερογλώσσαις. 22 – 012 reads πιστοις instead of πιστεύουσιν. 23 – 012 does not include ουν. 29 – 012 reads ανακρινέτωσαν instead of διακρινέτωσαν. 37 – 012 reads εστειν instead of εστιν (or εισιν) εντολη. The oddities of the text of 012 are myriad. Perhaps this is due to three factors in its textual ancestry: a copyist who did not hesitate to conform the Greek text so as to make its meaning agree more closely with his Latin Text, and a copyist who was nearly illiterate in Greek and who attempted to copy his exemplar’s contents mechanically, and a copyist who attempted to spell the Greek text in a somewhat phonetic way. As a result, Codex Boernerianus (along with its very close relative Codex Augiensis) is perhaps the most unreliable of all Greek manuscripts of the Pauline Epistles. Readers of the Nestle-Aland Novum Testamentum Graece may be interested to know that the Nestle-Aland apparatus’ record of the readings of 012 is occasionally in error. For example, as Reuben Swanson reported, in Galatians 1:8 012 clearly reads ευαγγελιζαηται, not ευαγγελιζηται. Swanson also reported that the N-A apparatus is wrong in Galatians 4:25; the reading from Codex 012 should be η συνστοιχουσα τη. (But not, contra Swanson, συνστοιχουσα δε.) Swanson listed other miscitations of Codex 012 in the Nestle-Aland apparatus in I Cor. 1:15, 1:22, 1:29, 3:1, 3:2, 3:3, 3:12, etc., etc. – not less than 50 imprecise or erroneous citations in just the first 10 chapters of First Corinthians. To go to Rome is to have much trouble, and little profit. Unless you bring here the thing (or, the King) you seek, you do not find it (or, Him). displeasing the Son of Mary. That these lines are written in Irish strongly suggests that Codex Boernerianus was made by Irish monks at the monastery of Saint Gall (in modern-day Switzerland). (Saint Columba’s student Gallus founded the monastery there.) Possibly these Irish lines represent a copyist’s (or reader’s) recollection of words attributed to Saint Bridgit in a story about the demise of Conlaeth (a.k.a. Conlaed, Conleth, Conlaith, etc.) – the first bishop of Kildare. The story goes that Conlaeth, in the year 519 or 520, wanted to visit Rome (perhaps to study advancements in metallurgical artwork, a craft in which he was gifted, or perhaps to replace his priestly wardrobe, which had been sold or traded in service of the poor) but Saint Bridgit refused to bless his plan, and warned him against leaving. As Saint Bridgit had predicted, the journey turned out to be fatal to Conlaeth, who, after departing, was eaten by wolves while still in Ireland. It might be worthwhile to explore the possibility that a lection from chapter 2 or 3 of First Corinthians was read in honor of Saint Conlaeth or Saint Bridgit in some lection-cycle used by Irish monks; that might account for the appearance of these lines at this particular place in the text. Two other items of interest in Codex Boernerianus are (1) the intriguing title of “The Beginning of the Epistle to the Laodiceans” after the text and closing-title of Philemon, which is followed immediately not by the patchwork composition presented in some Latin manuscripts as the Epistle from Paul to the Laodiceans, but instead by (2) several pages of a Latin commentary on the Gospel of Matthew, written by a scribe who used every square inch of the page. Readers are encouraged to explore the embedded links in this post, which will lead to additional resources.